Community-funded or crowdfunded wind and solar power is now being encouraged in the UK by renewable energy networking site EnergyShare, which is offering up £5,000 each for the first 5 renewable energy projects that also raise £5,000 on their own via the crowdfunding website. 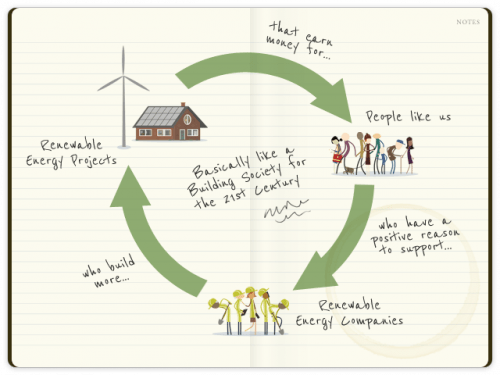 Another company,Abundance Energy, is also trying to get individuals and businesses to help fund and gain from clean energy projects, encouraging them to invest as little as £5 in wind turbines for an upcoming project. Is crowdfunding about to sweep into the clean energy sector? This is similar to what Solar Mosaic is doing in the US and what the Solar Schools program is doing for schools across the UK, but it is still a rather quiet trend, and the question is, will it take off? I certainly think it will. There is something very uplifting and fun about crowdfunding. And renewable energy is one of the most-liked, most-supported things on the planet. Combine the two and you allow people to ‘go solar’ or ‘go wind’ in steps and in cooperation with others, for a common good (what renewable energy is all about). If you’re also offered nice returns on investment, as it seems Abundance Energy is offering, what’s not to love? Real quickly, let’s run down what these two new options entail (since I’ve already covered Solar Mosaic and Solar Schools a bit). As stated above, EnergyShare is offering matching funds to early crowdfunders of solar or wind power projects. This initiative was just launched on April 12. EnergyShare and peoplefund.it are owned by Keo films, and as far as I can tell, they seem to just really be behind crowdfunding and renewable energy (while making a living off it themselves, I imagine). Abundance Energy’s first project is an effort to raise £1.3 million for a Resilient Energy wind turbine in the Forest of Dean. “Abundance will raise the money by offering debentures – a type of bond issued by an individual project. In return, the project commits to pay the member a share of the profits it makes generating green energy,” Business Green writes. Again, it looks like an effort to find creative funding for clean energy projects while also providing more people with the chance to prosper from clean energy investment. Here are some more details. The platform is aimed at individuals who are unable to install their own onsite wind turbines or solar panels but want to benefit from the returns of green energy projects. It will also be open to businesses, pension schemes, charities and other organisations. The original investment is paid back over the lifetime of the debenture, or as a lump sum at maturity. Resilient Energy’s project already has planning permission for a 500-800kW turbine it intends to install this year. Investments can range from £5 to £50,000 and Abundance has said it expects investors to get a rate of return of between 6.4 and 8.5 per cent during the lifetime of the project. Debentures will be issued on a first come, first served basis, and the offer will close once the target amount is reached. Early bird discounts will also be offered to people from the Forest of Dean or nearby area. The company aims to raise £250m of investment over the next five years and already has “several million pounds” of renewable energy projects planned for its first year. This is exciting stuff, in my opinion — skeptics amongst you, am I missing something or is this 100% good news? If I’m not off my rocker and this really is as cool as it looks, I certainly hope more folks will pioneer clean energy crowdfunding in the U.S. soon.